Burnley boss Sean Dyche ready to lead the Clarets in to battle for his 300th game in charge! Martin Paterson celebrates scoring the games opening goal. Clarets boss Sean Dyche leads his side into battle for the 300th time tomorrow at Turf Moor. And in a remarkable coincidence, tomorrow’s opponents Wolves are the same as in his first game in charge. In Burnley’s current predicament, sitting two points above the drop zone, a repeat of that 2-0 win in November 2012 would be most welcome. Dyche said: “I’d definitely take the same result again! I remember Pato (Martin Paterson) slotting one in, and Charlie (Austin) – of course he scored! Regardless of the milestone, Dyche knows his players have a huge seven games coming up to try and preserve their Premier League status. Sean Dyche and Ian Woan. 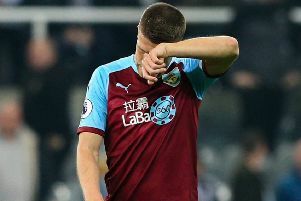 The Clarets have lost their last four games, and he said: “Nothing has changed, it was a bitter pill to swallow against Leicester, especially as they barely had an attack in the second half, but we still have to take care of ourselves. But he remains proud of what he has achieved in over six years at the helm: “It’s all about now and the future, but sometimes even I can look back and reflect, and it’s been a very positive 300 games in many ways. “Only a whistle stop tour, but the three biggest things that come immediately to mind are the Wigan game when we clinched promotion, 23 unbeaten to win the Championship, and seventh in the Premier League to qualify for Europe. “They are the outstanding highlights, and within all that, there’s been player development, international recognition, and the business model of the club.